Glorious Leader was originally planned as a send-up of North Korean "leader" Kim Jong Un, promising seven levels of irreverent silliness, with a planned release date of Q4 2014. A Kickstarter campaign followed but was ultimately cancelled, with the developers citing a hack as the primary reason and stating "Between the hacking and other threats, we think it is time to reevaluate our commitment to Glorious Leader! We thank our fans and supporters, and we are sorry to let you down." Here's what we originally had to say about the game. The Steam community is a curious crew, and so they have greenlit Moneyhorse Games’ Glorious Leader... presumably just to find out what the hell this thing is all about. 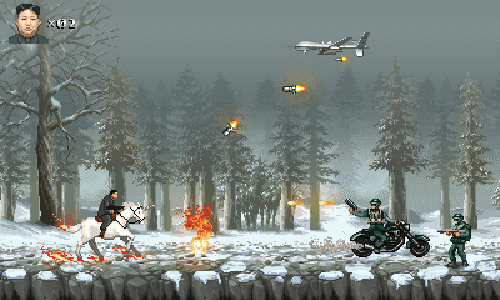 The game features Kim Jong-un singlehandedly destroying the imperialist regime, taking down hordes of soldiers and bosses with a wide array of weaponry across seven levels. The game also sees him occasionally riding a flaming unicorn and a narwhal, which as you may know, is the unicorn of the sea. The dictator’s repertoire includes zipline skills, American flag burning skills, riding horned animals skills, and befriending Dennis Rodman skills.